We have free campus-wide Wi-Fi! Bring your laptop, smartphone or tablet and hop onto our secure Internet connection. See your campus Librarian for the password. Databases are organized online collections of data. The Southern Technical College libraries subscribe to the Library Information Resource Network (LIRN). LIRN is a combination of 28 databases which consist of hundreds of thousands of published articles. You can find an ample amount of information to back up your claims for the writing and research that you do for your classroom assignments. The links to the guides below can be used when you need help writing your research papers and in using the APA format. Your campus LRC also has several other handouts available that you can pick up anytime. *Note that it is up to the discretion of your classroom instructor to insist on additional information to include on the title page. The LRC’s online Library World catalog is a database comprised of your campus collection resources. These resources come in different formats: print books, audiobooks, DVDs, professional periodicals, software, magazines, flash cards and other types of media. Resources can be taken off campus ONLY when checked-out by an actively enrolled student. 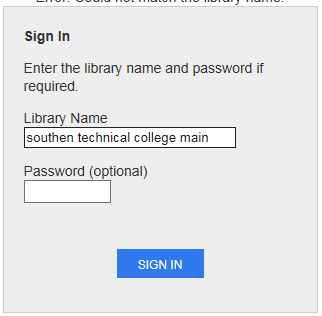 To open and search our catalog, type in Southern Technical College Main as the Library Name and leave the password block empty. The online catalog includes resources located at all STC campus locations. Therefore, when browsing the catalog, remember to view at which campus the resource is located. If you are interested in borrowing a resource from the Orlando campus library, fill out the Interlibrary Loan Request form or contact your campus librarian. “Print Check-out Log” when the librarian is OUT! For journals, magazines or other periodicals, write down the publication date instead of an inventory number. The publication date for periodicals is normally located somewhere on the front cover of the publication. Your cooperation is greatly appreciated and your collective cooperation will make our campus a successful & vibrant sanctuary of learning and growth for you and your classmates. If you need assistance and the Librarian is unavailable, please ask the front desk receptionist, a teaching assistant or an instructor for assistance. Do not leave the library with a resource without signing the resource out in the check-out log which is located on the Librarian’s desk. You can request to borrow a resource from the Orlando campus by clicking open the link below and submitting the online form. When you click submit, it will automatically email it your campus Librarian. You can request STC to purchase a specific resource by clicking on the link below. Fill out the form and when you click send, it will automatically email it to your campus Librarian. You can also print the form and give it to your campus Librarian.